Some friends from work - the partners - have invested with these folks. Yea then add the advisor fee to get them. Pass. That chart claims to be showing "expected returns for 1/1/1979 - 12/31/2015" for "the Dow Jones U.S. Total Stock Market Index," am I right? And yet, at the index provider's website, in the factsheet, we learn that the launch date and the first value date of the Dow Jones U.S. Total Stock Market Index" was January 1st, 1987. So... there is something wrong there. Sloppiness, probably, but something wrong, because they are showing statistics for the period 1979-2015 inclusive, for an index that didn't exist until 1987. This should at least convince you to take this stuff with a grain of salt. It's not my job to explain what they might or might not have done, but my guess is that they are playing fantasy football--calculating something over a shorter period of time, then extrapolating that over a longer period of time. So this chart is including performance for periods of time when the indexes shown didn't exist--and then even when they did exist there was no way to invest in them because the funds that track them didn't exist. Last edited by nisiprius on Sun Nov 18, 2018 8:59 pm, edited 7 times in total. DFA funds are passive, market cap weighted, funds that generally have deeper exposure to the size and value factors than corresponding Vanguard funds. Because they do not have to strictly adhere to an external index, they can participate in some activities that may well add value: screen for profitability, screen for momentum, use hold ranges, patient trading, screen out stocks historically found to perform poorly such as IPOs and stocks in bankruptcy. DFA also has Core funds and tax managed value funds that VG does not have. This is significant for the taxable investor. I think it’s fair to say that historically DFA funds have proven worthy of their higher expense ratios. Of course overwhelmingly, how a DFA fund will compare to its corresponding VG fund will depend on how the underlying factors perform. If size and value do well, DFA will compare favorably because of its deeper factor exposure. If size and value show negative premiums, VG funds with their lower factor exposure will look better. Note that historically the market, size, and value factors have been weakly or uncorrelated with each other, so the deeper factor exposures with DFA yield the ability to create more efficient portfolios. One can achieve the same exposure to size and value with Both DFA and VG, but the DFA portfolio will require less exposure to the market factor for the same size and value exposure. Also, expected returns are probabilisticly weighted averages of future outcomes, not statistics calculated from historical backtests. 3) the DFA portfolio uses DEMSX which is small value, Schwab's uses SFENX which is large, mid value. Schwab doesn't have a emerging small cap value. DEMSX outperformed the DFA emerging large value, so I used it as best case for DFA. BTW - what would be a profile of a "Core Fund" or "Tax Managed Value Fund" that would be part of a taxable portfolio..
As a factor investor, my biggest concern about DFA funds going forward is actually that they value sort only by P/B. I have well constructed arguments about why this may not work nearly as well in the future as it did in the past. I know Cliff Assness mentioned it was a only a small part of there sorts in the interview that was posted. LSV ( a large mostly institutional quant value manager) doesn't use it at all. That said I do use the DFA fund I have access to in a legacy 401k (emerging markets core). This. DFA is knocked out of consideration for the vast majority of bogleheads that don't have (free) access via a 401(k). "We're" not going to pay 50-100+bp just to access these. This is Bogleheads.org. Paying ~ 1% in fees is like running a 5K race, but waiting 1-2 minutes before you can even start. You need the alpha, if there is any, just to break even with the fee. I have DFA and Vanguard but my DFA fee is less than .25%. You can negotiate your fee. I agree .5-1% is too high. There are a couple of advisors out there who will give you DFA access for $1000/year. For many portfolios that is hardly 50-100 basis points. I'd point out the obvious about the gap since 2008-it's been a terrible time for value which is their specialty. Vanguard has to accommodate huge amounts of capital so value stocks especially small value can't take that much investment without Vanguard owning more than they are supposed to. DFA uses the advisory screen to limit some flows and hopefully keep people in during downturns. 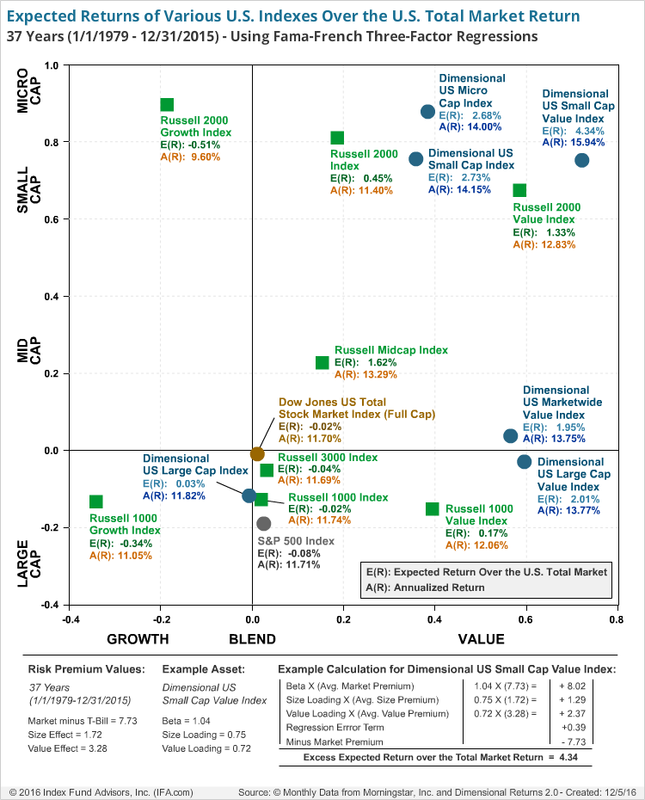 I'd wager that most of the difference in these returns has to do with DFA enhanced exposure to small value. That's what you are paying a higher expense ratio for so that's what I would expect to get. My quibble with DFA is that they aren't value enough. I'd rather get concentrated value in something like Alpha Architect's value funds and then buy my market beta from Vanguard. DFA is blending them together which dilutes both.